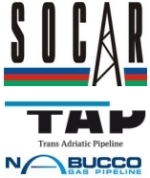 édité le 28/06/2013 - Plus de news de "Socar" - Voir la fiche entreprise de "Socar"
On June 28, The Shah Deniz consortium announced that it selected the Trans Adriatic Pipeline (TAP) to deliver gas volumes from the Shah Deniz stage 2 project to customers in Greece, Italy and Southeast Europe. During the press conference it was noted that the Shah Deniz Stage 2 project will bring gas from the Caspian Sea to markets in Turkey and Europe, opening up the ‘Southern Gas Corridor’. Shah Deniz Stage 2 is expected to add a further 16 billion cubic meters per year (bcma) of gas production to the approximately 9 bcma from Shah Deniz Stage 1. This Stage 2 development of the Shah Deniz field, which lies some 70 kilometres offshore in the Azerbaijan sector of the Caspian Sea, is expected to include two new bridge-linked production platforms; 26 subsea wells to be drilled with 2 semi-submersible rigs; 500 km of subsea pipelines built at up to 550m of water depth; a 16 bcma upgrade for the South Caucasus Pipeline (SCP); and expansion of the Sangachal Terminal. Further pipelines will be built and expanded to transport Shah Deniz gas through Turkey and Europe.